We’d love your help. 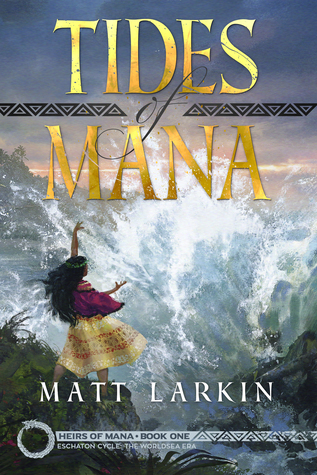 Let us know what’s wrong with this preview of Tides of Mana by Matt Larkin. Namaka turns the fury of the sea on her sister, wreaking untold devastation on the land and under the sea, earning the ire of the mer kingdoms. Their answe She controls the seas. Their answer: turn Namaka into one of them. Possessed by a mermaid spirit, she is drawn into battles in their alien world. To ask other readers questions about Tides of Mana, please sign up. What a fantastic fantasy story. Two sisters with different powers, one with fire and the other with water. Then a dispute between them. Totally mesmerizing. Thematically, Tides of Mana is probably as far from my Germanic Black-Forest-Dweller roots as you can get. And, having read the Norse-centric series Gods of the Ragnarok Era and Runeblade Saga before, it was quite a culture shock - but not necessarily in a bad way. Although it took me a bit to get the unfamiliar-to-me (and sometimes quite similar sounding) names straight, I enjoyed getting a first glimpse into the myths and legends of Hawai'i and Polynesia. But despite all the differences to the Norse stories, there were many common concepts and elements between the two series, to make me feel quite at home in this different world. As for the characters: Namaka may not be the most likeable protagonist, but I found her journey, especially her developing relationship with Nyi Rara, intriguing, and I'm curious to see how her quest for vengeance on her sister Pele will play out in the long run (my prediction, based on my experience with Matt Larkin's Norse series: everybody dies :-p). Matt was born and raised in Virginia, and graduated from the College of William and Mary there. His lifelong love of fantasy began with The Hobbit. This led him to start writing his own stories at a young age. His primary influences are mythology and history. He now lives in Florida with his wife.